Looking for something rewarding to do over the Thanksgiving vacation? Look no further! Join us at RakeTheRake for our three part exclusive Thanksgiving promotion. RakeTheRake rakeback players will also have the chance to win some huge cash bonus prizes should they win multiple freerolls within the Thanksgiving series. So here’s how it works, there are 20 freerolls over the four days of the holiday running from Thursday 22 November until Sunday 25 November. That’s five $250 freerolls a day, one at each of the following rooms: Americas Cardroom, Black Chip Poker, Carbon Poker Juicy Stakes and Lock Poker; a total of $5000 in prize money. And don’t forget to play our much loved annual Hidden Turkeys Promotion! Simply find the five hidden turkeys on raketherake.com from Thursday 22 November and be one of the first to email marketing@raketherake.com to claim your very own RTR hoodie! See full promotion details and terms and conditions. 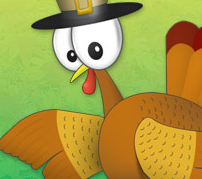 …where you’ll find all the passwords for the Thanksgiving freerolls. I will win! How do I get the winnings if I win? Helllo, i can register in them ? Really sorry to hear about your situation but glad to know that you enjoyed the weekend of Thanksgiving freerolls. How did you do? Any luck? hi, how to register for the freeroll $ 5000, thanks.